Kenneth C. Anderson, MD is the Kraft Family Professor of Medicine at Harvard Medical School as well as Director of the Lebow Institute for Myeloma Therapeutics and Jerome Lipper Multiple Myeloma Center at Dana-Farber Cancer Institute. 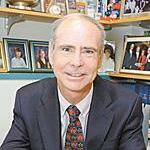 He is a Doris Duke Distinguished Clinical Research Scientist and American Cancer Society Clinical Research Professor. After graduating from Johns Hopkins Medical School, he trained in internal medicine at John’s Hopkins Hospital, and then completed hematology, medical oncology, and tumor immunology training at the Dana-Farber Cancer Institute. Over the last three decades, he has focused his laboratory and clinical research studies on multiple myeloma. He has developed laboratory and animal models of the tumor in its microenvironment, which have allowed for both identification of novel targets and validation of novel targeted therapies. He rapidly translated these studies to clinical trials, culminating in FDA approval of novel targeted therapies. His paradigm for identifying and validating targets in the tumor cell and its milieu has transformed myeloma therapy and markedly improved patient outcome. International Myeloma Foundation in 2005, the Joseph H. Burchenal Award for Clinical Research from the American Association for Cancer Research in 2007, and the William Dameshek Prize for Outstanding Contributions to Hematology from the American Society of Hematology in 2008. He was elected into the Johns Hopkins Society of Scholars in 2009, the Institute of Medicine of the National Academy of Sciences in 2010, and the Royal College of Physicians and of Pathologists (UK) in 2010. In 2011 he received the David A. Karnofsky Award from the American Society of Clinical Oncology.